June 1941 and the launch of Operation Barbarossa — the attempt to conquer Russia — marked a turning point in the Nazis’ strategy to solve what they believed was the Jewish “problem” within Germany. More and more, it appeared that government-controlled geographic relocation of the Jews of Europe to places in the east, not overseas in places of refuge, could be the most satisfying solution. In July 1941, Göring assigned Heydrich the task of drafting a plan. Hitler promised his inner circle that as soon as the war with Russia was over — expected before the first snowfall mid-October — the German Jews would be removed to the east. 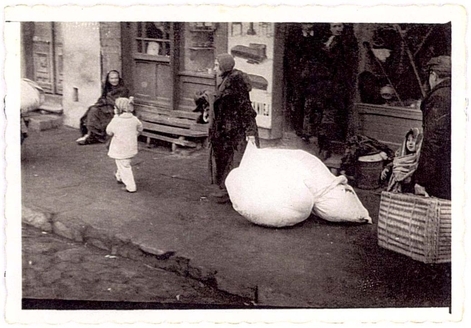 There had already been sporadic transports of German Jews: in February 1940, over 1000 German Jews had been deported over 900 km south from Stettin to villages near Lublin in occupied Poland; one of the villages was Belzyce, later to be the destination for the first major deportation of Jews from Thüringen. In October 1940, German authorities in Baden, acting on their own authority, had rounded up and deported 6500 Jews from Baden in southwest Germany into the Gurs region near the Spanish border. In February 1941, five transports had taken 500 Jews from Vienna to places east. The orders were rapidly formulated and implemented: each transport was to include 1,000 people, if not more. The first transports were to focus on large cities, particularly Berlin, where the largest number of Jews — including a dozen Themarens — lived in 1941. Less than one month later, the transports to Litzmannstadt Ghetto began: on October 15, 1941, a transport left Vienna carrying over 1000 Jews; On October 16, the first transport from Germany left from the western border of Germany at Trier — it carried two members of Themar’s Jewish community, Hugo and Eva Friedmann. On October 18, one thousand Jews were transported from Berlin. By November 1, 1931, this first wave of deportations was complete: over 10,000 German Jews had been transported to the Litzmannstadt Ghetto, primarily from the large cities such as of Berlin, Frankfurt, Hamburg, Düsseldorf, and Cologne. Transports then began to take the Jews to ghettos in the occupied Baltic region — Riga in Latvia and Kovno in Lithuania — and Minsk in Russia. By the end of 1941 — that is, before before the Wannsee Conference and the full operation of the killing centres of Treblinka, Sobibor, Belzec, and Auschwitz — over 30,000 German Jews had been deported “east” to ghettos. There they either died of starvation, cold, or disease, were killed by Einsatzgruppen or other German military, or to await their fate. What exactly was to happen to them was yet unknown. On one hand, if the Germans won war with the Soviet Union, then the German Jews might be moved into the spaces left by the ongoing slaughter of the Soviet Jews or pushed further east into Siberia. On the other hand, experimentation with killing Jews with gas offered the Nazis another possibility to ‘solve’ their self-assigned problem.